HANDOVER: Scott Stallman and Shayne Moore shake hands after Scott becomes the owner of the trailers. A BIT of sibling rivalry goes a long way when its helps to raise money for Endeavour Foundation. Managing director of Moore Trailers Shayne Moore and his brother Grahame, who will pit Ford against Holden in the upcoming Great Endeavour Rally in July, worked together to make two 24m³ triaxle side tippers and one triaxle converter dolley for the charity recently. "We wanted to do something for the 25th Great Endeavour Rally in July," Shayne said. The trailers were sold at tender and raised just over $200,000. Moore Trailers have a long history with the foundation. Shayne's father Lionel has been taking part in the Endeavour Rally for 15 years, while this year will be Shayne's fourth. "Endeavour Foundation supports everybody with disabilities. It's a very worthwhile cause, this year they are taking 10 clients on the rally," he said. "I really enjoy it, it's a lot of fun." rivalry when we are rallying". Now the proud owner of two 24m³ triaxle side tippers and one triaxle converter dolley Scott Stallman said the acquisition was for a good cause. The managing director of All States Truck & Commercial Rentals said he needed them but was more than happy to tender for the trailers. "It was a good cause. Moore's is a local company and we like to support locals," he said. "It was a very good concept." Mr Stallman said he had worked with Moore Trailers previously and they had "been good to us". 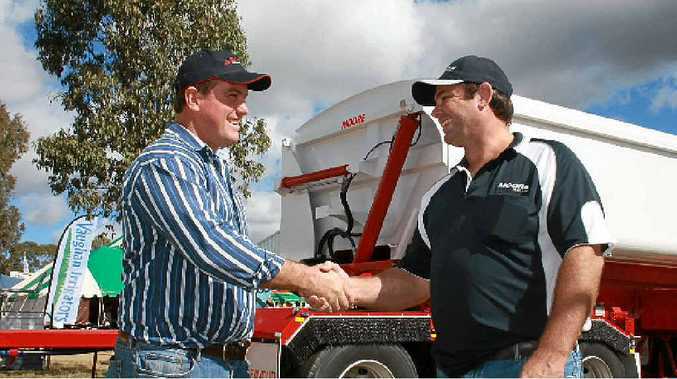 But the connection runs deeper than just buying trailers, Shayne and Scott went to the same school in Pittsworth and Grahame used to work for Mr Stallman's father on the family farm also in Pittsworth. "We needed the trailers, they're versatile and can be used anywhere," Scott said. He runs the truck and trailer rental business, which started six years ago, out of Toowoomba, but said there were branches in Emerald, Mackay, Melbourne and Perth. All States Truck & Commercial are specialists in dry hire to mining companies. They provide project specific trucks including fuel trucks, service trucks, off road trucks, 4x4 trucks just to name a few. Moore's were supported in building the trailers by Oilpath, Colorcorp, Samios Tyres, Southcott Hydraulic Control Systems. The trailers were shown off at the Melbourne Truck Show. Moore's exceeded the $125,000 back in 2009 when they also donated trailers for the foundation. They were built during normal production in a month. The official hand over took place at FarmFest outside of Toowoomba on June 7.